An iDevice app for advanced math students and a "kiddie Kindle" for early readers are two of the many new ways that technology can help students of all ages. This news might make you feel a little bit better about breaking down and buying your child that iPhone he or she has been begging for: Thanks to the app Graphing Calculator by Appcylon, there’s no need to shell out another $150 for that powerful, essential accessory to all advanced math courses. For just $1.99 from the iTunes store, Graphing Calculator does all that a standard graphing calculator does, and does it better, too. The display is sharp and clear, lines can be presented in different colors, and the interface is streamlined instead of being clunky. 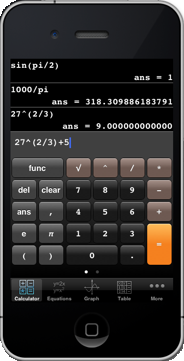 Graphing Calculator works on all iOS devices. A word of caution, though: Be sure that your child’s school will allow him/her to use a phone/iPad/iPod Touch in class and on tests before relying solely on this app for all calculation purposes. Think of Vtech’s interactive e-reading offering as a "kiddie Kindle" -- kids read downloaded electronic books on its high-resolution screen, look up words they don’t know, and much more. The device is rated for users from age 3-7, so while pre-readers can choose to have stories read to them and enjoy the animated pictures that accompany the words, beginning readers can read the stories themselves. V.Reader also features a helpful tutorial function in which tapping a word with the stylus or just a fingertip provides the reader with a definition or help sounding the word out. Kids can play games or create digital artwork as well, and a tracking mechanism allows parents to monitor their kids’ progress. New e-books can either be purchased in cartridge format or downloaded via a computer and transferred to the device. The V.Reader is made of durable plastic and comes in either pink or blue, and parents will be relieved to know that they can silence the beeps and whistles typical of children’s electronic games by plugging their tots into the headphone jack. The downsides are few, but are worth pointing out. For one, the V.Reader plows through batteries – it requires 4 AA’s to run – so investing in a battery charger may be wise if you buy a V.Reader for your child. Additionally, the stylus is not tethered to the reader and can be easily lost, so it may be a good idea to require that it live in a special place while not being used. Overall, however, reviews of the V.Reader have been overwhelmingly positive. Kids seem to love it, and parents report that they are seeing literacy progress. 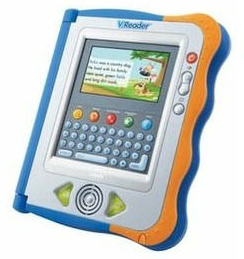 At $39.99, the V.Reader is a good deal, one parents will appreciate even more when they don’t have to read the same bedtime book to their little one for the tenth night in a row.